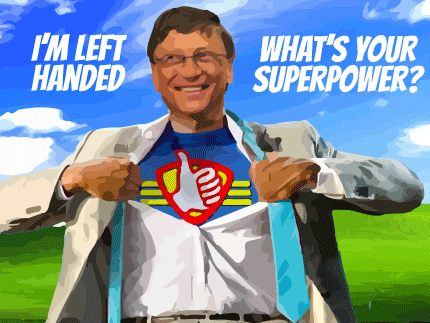 The International Left-Handers Day was celebrated on August 13 all over the world. This day has been celebrated annually since 1992. It’s a day that raises awareness about the issues that left-handed people have to deal with. Most things in our world (such as door knobs, tools, can openers, scissors, and so on) are designed for right-handed people, and left-handed people have a hard time using them. It’s also a day when left-handers celebrate being left-handed. Approximately 10% of the world’s population is left-handed. Bill Gates (known for co-founding the company Microsoft) and Mark Zuckerberg (CEO of Facebook) are both left-handed. Here is a video about why some people are left-handed.